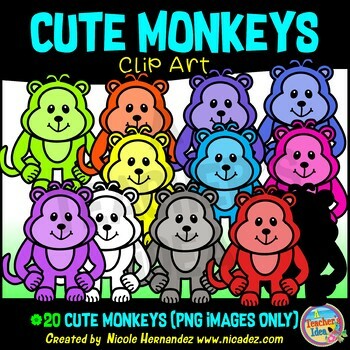 This is a set of 20 colorful monkey clip art images for use in your creative teaching resources. They can be used to create worksheets, flashcards, posters, anchor charts, bulletin boards and countless other teaching resources, plus, the transparent background makes them easy to drag and drop into your project’s layout. All images were created by Nicole Hernandez. If you are interested in more clip art for teachers visit My Clip Art Sets now! • Files come in zip format, therefore, you must know how to unzip files on your PC/Mac to retrieve them. • You will need software that supports the use of PNG files. *This graphics set is NOT to be sold or uploaded “as is” to any teacher sharing websites NOR can you “share” them with others via e-mail, bulk mail sender or any other digital means. 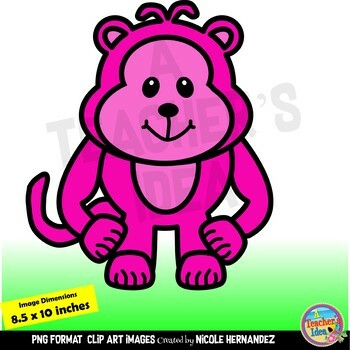 *My clipart can be used to create invitations, cards, planner stickers, party printables, finished art prints or compositions, bookmarks. *These terms apply to small business. They cannot be used on products (e.g. published books, T Shirts, mugs, stickers, toys) unless you purchase an additional license. ***ADDITIONAL LICENSES ARE AVAILABLE HERE. *** Please do not hesitate to send me a message if you have any questions. *Purchasing this set does not transfer the copyright to you. You cannot claim the design as your own. *This license is non-transferable. This means you cannot transfer or give the license to anyone else, nor can you change the item that it applies to. *You may use these graphics to create and distribute both free and paid print-ready documents as long as they are in a flattened and locked PDF. You can also use them in SMARTboard, Mimio, Google DriveTM, Microsoft OneDriveTM, Activboard, Boom Learning or Powerpoint files for resale as long as they are inserted and locked into the background and cannot be lifted. Thank you for respecting copyright laws and the artist that created them.